The first assessment on Livyaton Mellville is that the reconstructions are improperly based on evolutionary presuppositions. It seems that the current “academic-authority” uses artistic licensing as visual evidence. This has been going on for years promoting a more pantheistic view of the fossil record. 1) The “PORTRAYALS” are forced into multi-species or in-between species representations. Solution: Base the representation on the species that the fossil is exactly alike. In this case it is identical to the killer whale with no similarities to the sperm-whale or any other species that is not the killer whale. Possibly the false killer whale being the only exception. Until dna analysis is verified and upon which that data would be proof of this matter the killer whale remains the only candidate. 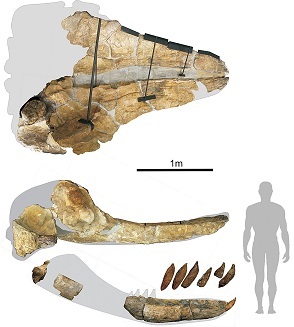 2) Macrocephalus reconstructions: Whenever a fossil skull or teeth is all that is known of a species the tendency is to assume a macrocephalus reconstruction. Solution: Because in the fossil record the majority if not all of the known “full-skeleton findings” indicate that the greater ancestors of the past are indeed mature, therefore the head to body ratio is smaller, meaning: As maturity continues the body is larger in comparison to the head. This is true with all species maturity. A microcephalus reconstruction is in order. The head retains not a proportionate but should be rendered with an even larger body, not a smaller one as is done here with livyaton. Extend the body, the creatures body should be much larger than the head like the fossil sea cows microcephalus ratio, the giant armodillos, the sloths all have a larger body and a smaller head, so when a large head is found it should be represented with a larger body every time. The Livyaton has all the features that one would expect in a more mature killer whale. This drawing of Livyaton is slightly altered from the actual fossil that appears with a harder jawline and a more angled upper snout. * Notice the gray area of the lower jaw, this area is left to imagination. Notice the smooth domelike top-of-the-skull shape is gray. Dolphin similarity missing. The actual bones suggest distinctly killer whale greater ancestry. A, B, & C are Livyaton teeth. 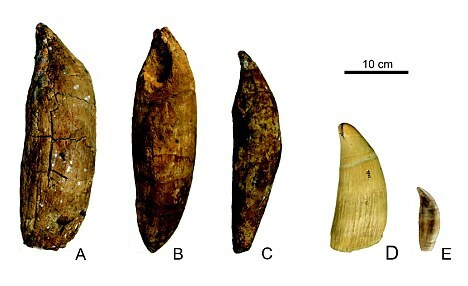 D A a dissimilar tooth is of a sperm whale (no relation) E is the weaker descendant known today as the killer whale. Dentation: The teeth show no cross species, no common ancestry but is exactly what you would expect in greater ancestral models. 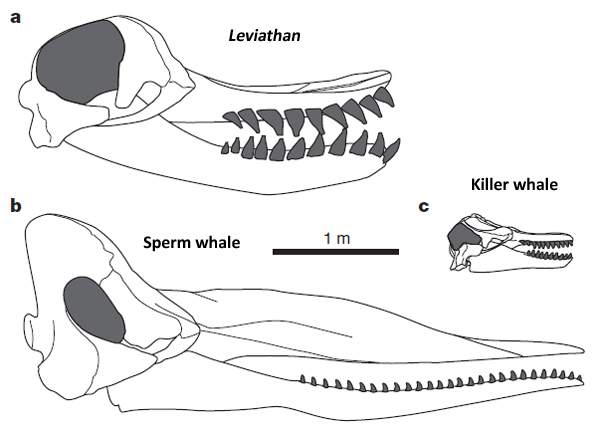 Conclusion: The Livyaton is a greater killer whale with no similarities to other species. The dentition alone would suggest its classification as a killer whale. There is no reason to start any suggestions of this creatures extinction when there remains a living weaker descendant. The head to body ratios are off by about 28-42%, the bodies would be about 34% larger than the largest estimates now based on maturity, other microcephalus models, and allometric ratios.